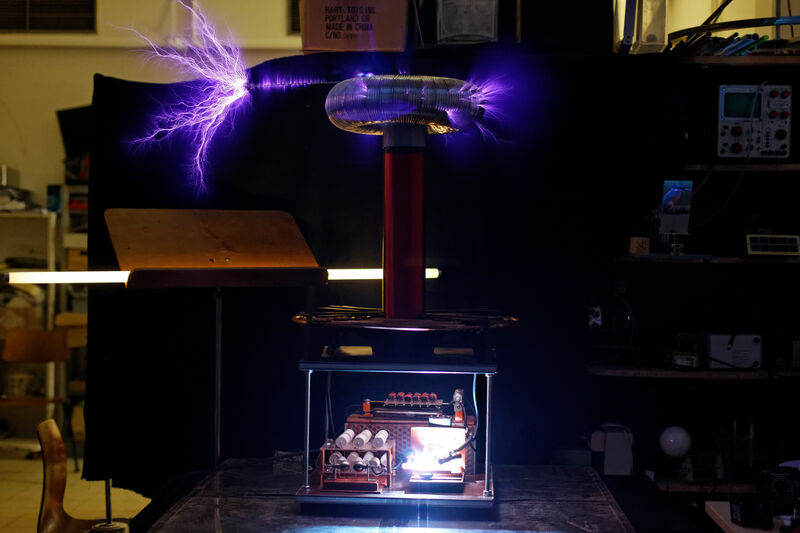 Zeus is the first Tesla coil I've made ; it's actually the very first time I "got my hands dirty" with physics (i.e. actually building something that works). 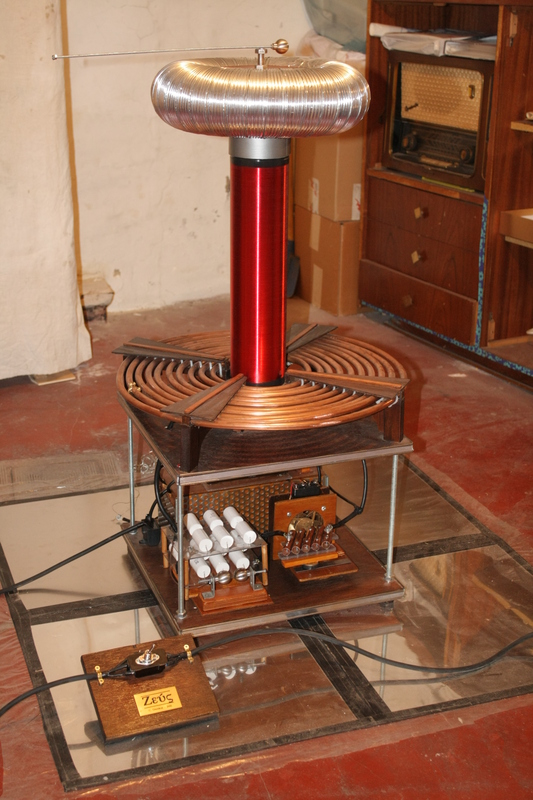 This coil was presented to the Printemps des Sciences 2012 science fair and is now at the Expérimentarium de Physique science museum at ULB. It was named Zeus (Zεύς in ancient Greek or Δίας in modern Greek) ; after the Greek god, king of the Olympians and known for throwing lightning bolts. The construction of Zeus was not an easy task and almost every component had to be rebuilt at least twice. This however allowed me to acquire my first experience in the domain of high voltages, which was probably the greatest reward this project gave me. Pictures of the coil running or in construction can be found on this photo album. You may also want to check this video of Zeus performing (warning : background music). Total project cost (estimated) : 1700 €. Here's a quick review of Zeus' characteristics. More details can be found the appendices of the PDF version (see below). These page about the theory of operation of Tesla coils as well as the specific behaviour of its individual components. It also relates the steps of the construction of the Zeus coil in particular. We will only discuss the conventional Tesla coil, consisting of a spark gap and two tank circuits and called Spark Gap Tesla Coil (SGTC). In fact, Nikola Tesla also conceived a more advanced type of coil, the magnifying transmitter, which is made of three coils instead of two and which operates in a slightly more complicated manner. In addition, there is also a class of semiconductors-controlled Tesla coils called Solid State Tesla Coils (SSTC), which are structurally different but share the same theoretical basis of the conventional Tesla coil. To fully appreciate the content, I recommended that you master the fundamental concepts of electromagnetism and alternating current (All About Circuits is an excellent online resource ; volumes I and II largely span the "engineering" part of the aforementioned perquisites), as well as the basics of differential equations. Note : These webpages are actually adapted from a report I wrote during my second year of undergraduate physics studies. The content of the website and the report are exactly the same, only the way information is structured changes. The document can be downloaded from the links on the right (PDF format, 9.5 Mo, available both in English and French). Another note : You really should prefer the webpages though, they are likely to be more up-to-date, contain less typos and dead links.